Volkswagen of American and the U.S. Soccer Federation announced a multiyear presenting partnership. Volkswagen’s commitment will help U.S. Soccer increase participation, develop players and coaches, and engage with fans. VW is the first automotive presenting sponsor in U.S. Soccer History. The eight-figure deal is the second largest partnership/sponsorship in U.S. Soccer history after Nike, and extends through 2022. The automaker was previously the official vehicle of the pro soccer organization, Major League Soccer, from 2008 to 2015 before being succeeded by sister brand Audi. VW will have prominent in-stadium and training camp placements on U.S. Soccer creative materials for National Teams matches, along with a significant presence in the organization’s social media and digital efforts. The automaker also will have branding on training tops for all U.S. Soccer National Teams, including the Men’s and Women’s National Teams, all Youth National Teams and the Para 7-a-side, Beach and Futsal National Teams, and the U.S. Soccer Development Academy. The agreement was facilitated by Soccer United Marketing, U.S. Soccer’s partner for the past 15 years, and was officially unveiled today at a press conference during the North American International Auto Show in Detroit that featured Volkswagen Group of America CEO Scott Keogh and U.S. Soccer CEO and Secretary General Dan Flynn. As part of Volkswagen’s long-term commitment, the automobile maker will help U.S. Soccer with its mission to become the preeminent sport in the United States. 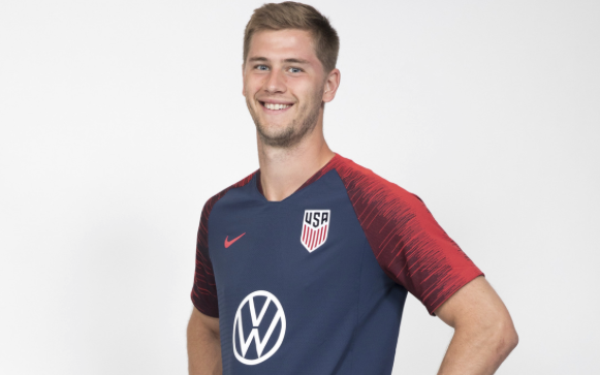 “Volkswagen is an incredibly strong brand that has a fantastic reach with current and potential soccer fans across the United States, and partnering with them will allow us to take huge strides forward,” Flynn tells Marketing Daily. Volkswagen’s support will fund programs and provide assistance to develop more female coaches in the United States. While 47% of youth soccer players are women, only 15% of coaches are female. With the deal announced on the heels of the 2019 FIFA Women’s World Cup in France, Volkswagen will be activating during U.S. Soccer’s Countdown to the Cup from January to May, which includes the USA playing a total of 10 games before departing for France in pursuit of another World Cup title. As part of the partnerships, Volkswagen also becomes the presenting partner of Tournament of Nations a round-robin international women’s tournament that takes place in the United States every year there is not a Women's World Cup or Olympics. The next edition will take place in 2021. Soccer United Marketing’s goal is to facilitate meaningful partnerships between iconic brands committed to raising the profile of the game, driving participation, and creating innovative programs that authentically connect with fans, said Carter Ladd, Soccer United Marketing/MLS vice president of business development.